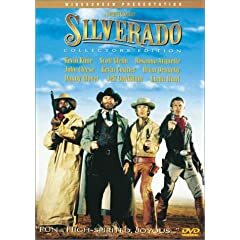 Westerns were pretty much dead in 1985 when Lawrence Kasdan resurrected the genre with “Silverado,” which I’m adding to my Movies You Might Not Know list. Kasdan had proven his prowess as a screenwriter with “Raiders Of The Lost Ark,” “Body Heat,” “Empire Strikes Back,” “Return of the Jedi,” and “The Big Chill.” He knew the classic western formula — a group of good guys helps protect innocent people being persecuted by an evil powermonger and his cruel associates — and rounded up a stellar cast for “Silverado,” including Danny Glover, Scott Glenn, Kevin Kline, Rosanna Arquette, Jeff Goldblum, Jeff Fahey, Linda Hunt, and an impossibly young newcomer named Kevin Costner. There are gunfights galore, morality plays, a cattle stampede, lots of scenic vistas, and two of the best bad-sheriffs ever in Brian Dennehy and John Cleese (!). You wouldn’t want to spend two days in the town of “Silverado,” but Kasdan makes these two hours worth your time.